Before the Ferrari Formula One team unsurprisingly announced it would trade 38-year-old Kimi Raikkonen out for younger driver Charles Leclerc this week, someone started a petition to keep him around on Change.org—the “web’s leading platform for social change,” as it calls itself. A valiant effort. The petition organizer argued Ferrari needs Raikkonen to keep the balance with current teammate Sebastian Vettel, and that “Kimi has also outperformed Vettel [a] number of times proving he is back on form and his drive in Monza just adds more credibility to that.” So there the plea for Ferrari to have mercy on its aging driver is, on Change.org, amidst a bunch of petitions for animal rights and such. But, of course, do what you’ve got to do for the things you believe in. 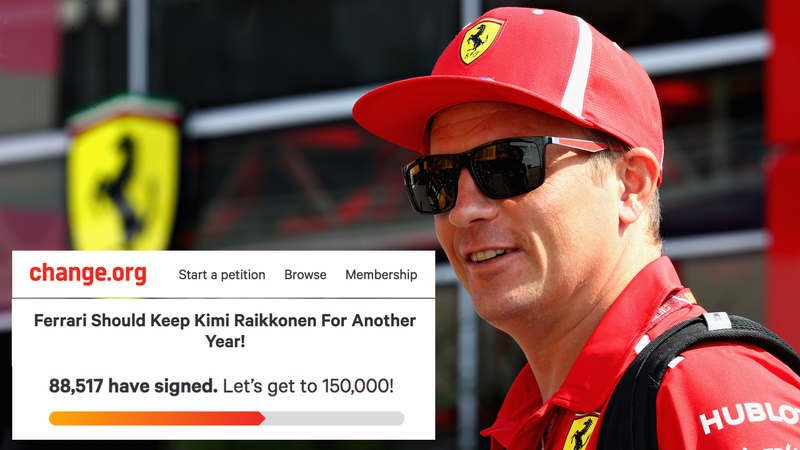 More than 88,000 people signed on to support good ol’ Kimi in the five days the petition has been online, but in the end, it wasn’t enough. He’s going to Sauber for at least the next two years, while fans continue to sign the petition to keep him at one of F1’s top teams. Around 200 people have signed in the past hour, if the website’s signature counter is right. Again, a valiant effort—one that just keeps going. Someone start a new petition to keep Ferrari from giving him team orders for the rest of the year, please. The Ferrari team announced it would replace Raikkonen while he’s third in the F1 championship standings, despite it being hard to break into the top four if you’re anyone other than a Mercedes or a Ferrari team driver. His teammate for now, Vettel, is in second and trying to catch up to leader Lewis Hamilton. Alas, after this year, Raikkonen will be at the Sauber team where he started his F1 career in 2001, mumbling about stuff on television until at least 2020. With the way this plea to keep him at Ferrari is going, 2020 may also be around the time people stop signing this Change.org petition.